Esta cabine foi transformada em 2011 em uma escapada aconchegante situada no coração de Guerneville, a apenas uma hora e meia ao norte de São Francisco. Existem 40 passos para o primeiro nível. O primeiro nível oferece um quarto com casa de banho privada e sair para o convés principal. O deck principal tem uma fogueira (duraflame apenas) e cadeiras Adirondack para as noites quentes, juntamente com uma churrasqueira para churrasco. O piso principal tem uma sala de estar, dois quartos e casa de banho principal. Temos acesso wi-fi, Apple TV e um leitor de DVD. Há uma redbox na cidade que você pode alugar filmes ou pode usar nossa conta da Apple TV com 80 filmes comprados, Netflix, Hulu e Amazon Prime Videos. A casa é aquecida com uma lareira a gás bonita que é controlada por termostato. O piso principal também tem uma cozinha completa com geladeira, lava-louças, fogão e micro-ondas. Há dois quartos com generosas debaixo da cama compartimentos de armazenamento e arrefecimento a partir de ventiladores de teto. Há três pavimentos adicionais, todos acima do nível da rua completamente privado. O deck mid-tier tem uma banheira de hidromassagem de seis pessoas, rodeado por árvores de pau-brasil. O deck superior, acima da cabine tem uma mesa ao ar livre de oito pessoas pronto para acomodar um íntimo partido poucos ou maior. O deck superior tem uma plataforma de vista com cadeiras de Adirondack para leitura silenciosa. O acesso ao rio russo é apenas uma curta caminhada (menos de dois quarteirões) da cabine. Palavras-chave: Este é um belo pequena cabana nos bosques com uma agradável mistura de sol que vem através das árvores. Luxo e natureza mista. I plan on coming back to visit this beautiful cabin nestled in the woods....our stay was perfect! Our visit was a family Christmas. The weather was very cold, and wet. You need to really watch your step on the stairs, as if wet, also have some mold. I do not recommend this place for anyone with physical disabilities. Your party should not be larger than 6. The living room, tiny dining, table, and small kitchen space, are all in one small room, which feels like a studio. Also, the master is not connected to the main part of the home, so you need to go outside and either up or down, a flight of stairs. I think that the cabin would be more suitable, for summer visitors. I think this was one of those vacations that was cursed from the start. Not to mention that while the guests were there a tree fell through the hot tub during a winter rain and pierced it. My family of four spent three nights in this cozy but modern cabin, and we loved our stay! The cabin is clean, has comfortable beds, plenty of linens and kitchenware, and really has the feel of a more remote setting. The owner is very responsive to any questions. I hope we have an opportunity to stay here again! Thanks dear guest for the feedback. The oven has been replaced and the new one is very snazzy. I need a refund on my cleaning fee since it was not cleaned well before we arrived. We were in town for a wedding so we spent little time in this unit but if you were using this as a destination, pick another property. This is my first VRBO rental and I will get smarter. This rental had no clothes closets, no news cable channels, pets had been there so watch out for allergies, and only queen size beds--no kings. It had been remodeled but it must only be used as a rental because the bedding and towels were tired and I didn't get the feeling that the bedspread was washed often. I was charged a cleaning fee but it was not particularly clean when we arrived--crumbs on top of the refrigerator, weird lint on the coffee table and opened condiments in the refrigerator that no one would ever think to use. The shower also was slick so I am thinking that the cleaning service just squirted soap and didn't scrub or rinse it. As you can guess, we didn't use any of the kitchen glasses or dishes. The renter is right there are no closets. It's a small depression era cabin and they were all on the small size. We have fixed the cable news issue but installing Apple TV for our guests. They can stream a ton of different programs. The renter is right in that we do allow for pets. We clean very thoroughly afterwards. We don't charge extra. The beds are indeed queen-size. There isn't room for king size in the bedrooms. We do let guests leave condiments and charcoal and lighter. Up until now we haven't had any comments on sharing ketchup and mayo. If we receive more we will re-address the policy. As for the cleaning, I have a service that comes for the spa and cleaning after every stay. The lady that does it has been cleaning for me for 7 years and does a wonderful job. We are sorry we didn't meet your expectations but we will still welcome you to come back someday and give us another shot. This is a beautifully decorated and well maintained home and was fine for two nights with 5 women. The 3 bedrooms are good sized with comfy beds. There are no closets so plan on living out of your suitcases. Both bathrooms are large with plenty of storage in the upstairs bathroom. The living room is very small and the seating is uncomfortable. The couch is a futon and the mattress kept slipping down so we finally just opened it up and sat on it like a chaise lounge with pillows behind us. That really needs to be fixed. We blew a fuse at breakfast and were never able to reset the hot tub fuse so only used it our first night. Our neighbors had obnoxious parties both nights and we finally had to call the sheriff to quiet them and their music down. There is a picnic table but not convenient to get to so we ate in chairs on the deck as there is no table inside which was fine. We brought prepared food that could be eaten cold or warmed up and i would recommend that as the counter space is tiny. Two cars in the driveway need to be small small cars. And from the driveway to the front door are 49 stairs!. We are hikers so we are in good shape for seniors. 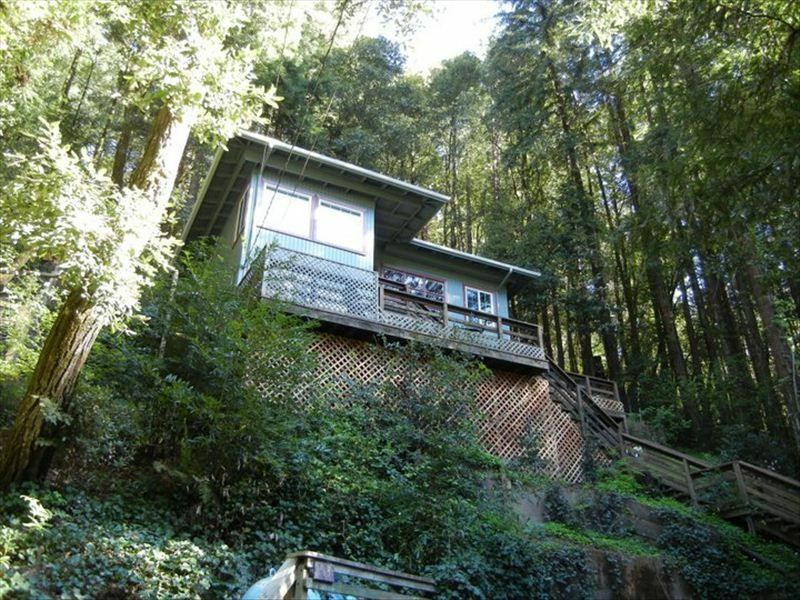 I loved sitting on the deck enjoying the redwoods. It was nice and priced right but next time i will look for something bigger. Thanks for the feedback dear guests. The futon from hell is no longer. We bought a lovely couch that is super comfy. The fuse issue has been resolved by our local electrician. The party issues have been addressed by Sonoma County. They are only giving 3 warnings before the person loses their license. So hopefully that will make everyone' stay nicer. Just FYI quiet hours are 10pm to 8am. There is room for 2 honda accords. Probably not room for 2 Chevy Tahoes. There is space down the road for more cars.